Home › FAQ › What is the LSAT and What Type of School Requires It For Admission? If you would like to further your education once you have earned a bachelor’s degree, you may want to learn about the LSAT and type of school that requires it for admission. The LSAT, which stands for Law School Admission Test, is a standardized entrance exam that is specifically for students who are applying to law school. If you would like to earn your Juris Doctor degree so that you can take the bar and get licensed to practice law, you will eventually need to sit for the LSAT exam. Read this guide and find out what you will be tested on, how your test is scored, and what constitutes a good score. What Does the LSAT Measure? The law school admissions process is a fairly uniform one. To apply to law school, a prospective student must have the right undergraduate coursework under their belt. They must also earn an acceptable GPA, demonstrate their commitment to citizenship and show that they are competent by achieving a good score on the LSAT. 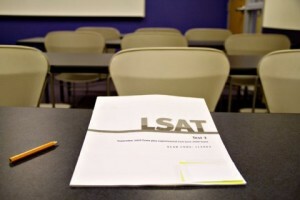 The LSAT measures a student’s skills and their ability to grasp the advanced curriculum all law students must complete, according to the Law School Admission Council. Since law students must be analytical by nature and need to be able to reason, admissions councils have decided to sift through applicants by requiring the test. How is the LSAT Structured? The LSAT consists of five different multiple-choice sections, according to the Princeton Review. Only four of the sections are actually scored. The scored sections of the test include: logical reasoning, analytical reasoning, reading comprehension, and the essay response. The fifth section that is not scored is strictly to help evaluate whether or not questions should be added to the test in the future. Test takers will have 35 minutes to complete each section which consists of no more than 27 questions. Understanding how the LSAT is scored can help you set your sights and aim for a high score. Without truly knowing how each section is scored, you could easily be confused on the results when they are sent to you and then forwarded to the schools that you are applying to. Scoring can be extremely confusing due to the fact that there is a complex scoring scale. The test contains between 100 and 101 questions and the raw score will represent the actual number of questions that were answered correctly. A score conversion chart is then used to convert the raw score to the reported score. The scale ranges from 120 to 180, with 180 being the highest possible score. What Do You Need to Score for Acceptance? While scoring 180 is best, having a score of 160 or higher is sure to get you into the best law schools. You would essentially need to earn a 99 or 100 to get a 180 scale score. A score of 150 is considered to be average. Be sure to set realistically goals, but prepare to for each LSAT section instead of just cramming right before the test date. The LSAT, while it is challenging, is a beatable test for those who are prepared. Take preparation courses and use study plans and materials to your advantage. Now that you know about the LSAT and type of school that requires it for admission, it is time to start planning for law school.